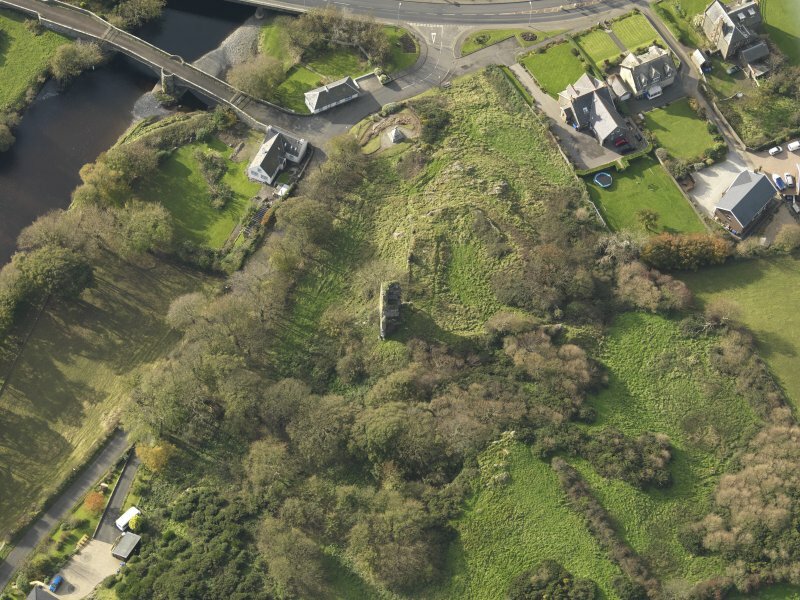 Oblique aerial view centred on the bridges with the remains of the castle adjacent, taken from the SE. 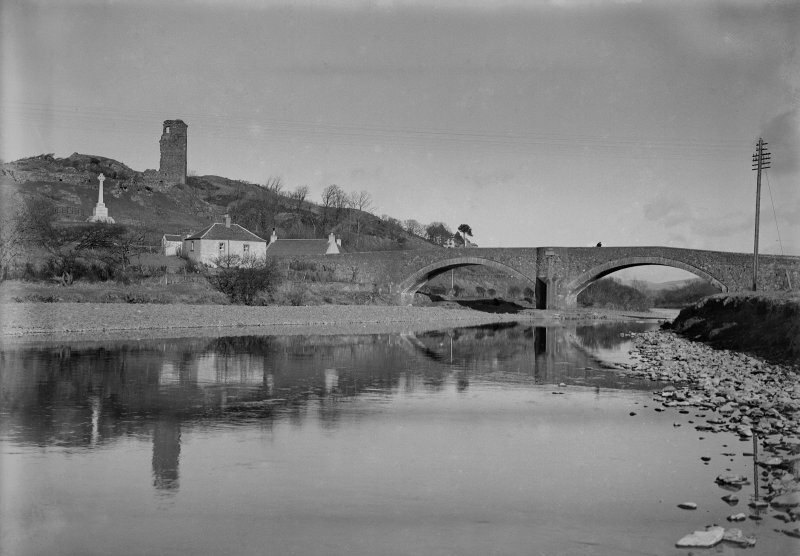 View of Ballantrae village showing the bridge, toll house and war memorial and the remains of Ardstinchar Castle. 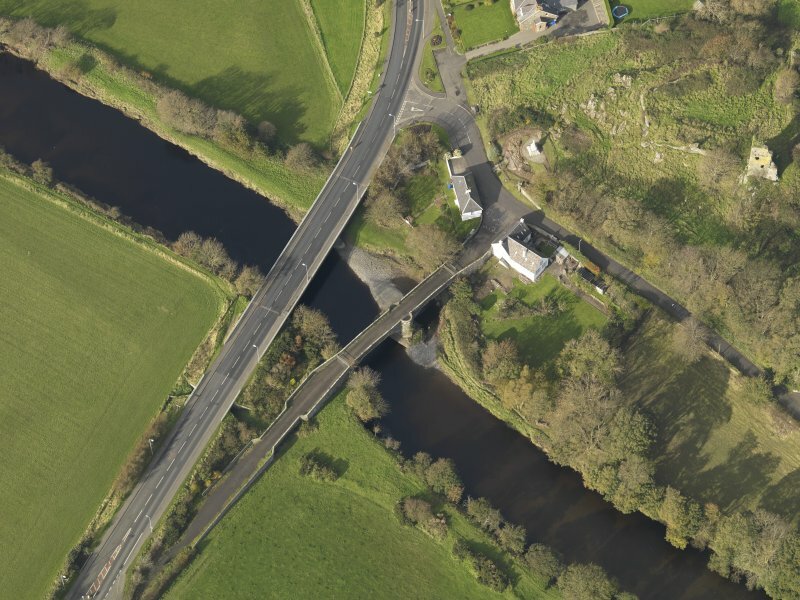 Oblique aerial view centred on the bridges with the remains of the castle adjacent, taken from the NE. (NX 0867 8241) Ardstinchar Castle (NR) (Remains of). Ardstinchar Castle is said to have been built by Hugh Kennedy in the middle of the 15th century. Now reduced to a fragment of the keep and a few wall foundations, it originally occupied an irregular platform circa 120' square. 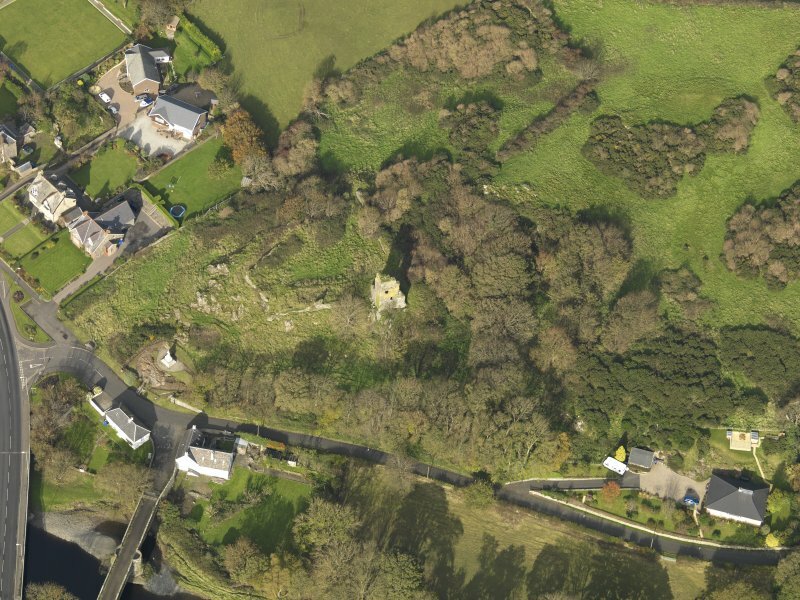 The gate was apparently at the NW angle, and the keep occupied the highest point at the eastern angle. About 1770 the castle was used as a quarry for material for a bridge over the R Stinchar. 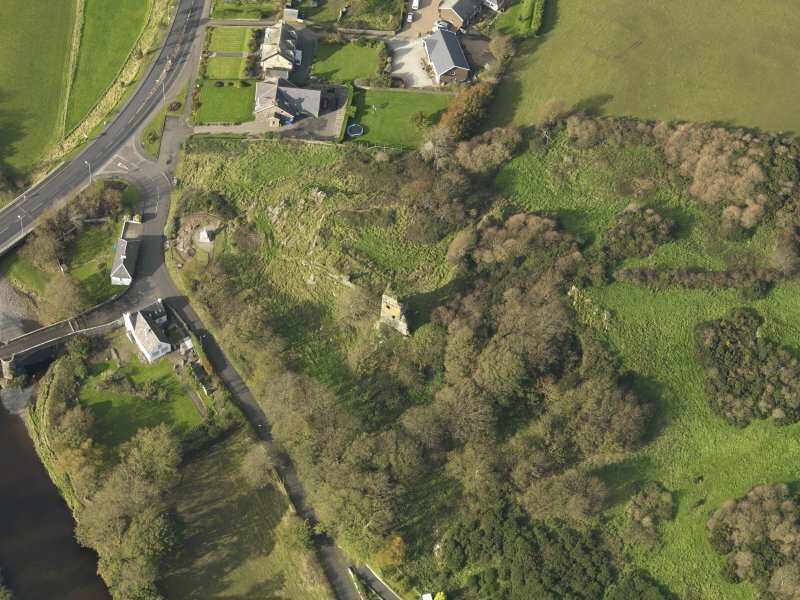 The remains of Ardstinchar Castle, occupying the summit of a rock outcrop, consist of an irregularly shaped, four-sided court-yard with the main tower on the east and a second tower in the middle of the west wall. The main tower measures 8.7m by 6m over walls 1.1m thick and stands to a height of 15m. The remains of the other tower are too slight for measurement. The court-yard wall varies from 1m to 1.6m wide and there are traces of subsidiary buildings abutting its inner face. The entrance to the court-yard was apparently in the north angle where socket holes are visible in the wall. A rock-cut ditch 8m wide and 1.5m deep lies outside the NE court-yard wall, and on the west there is a shallow ditch, 7m wide by 0.6m deep, with a broad rampart about 3m high on its counterscarp. Name confirmed. No change from previous field report. 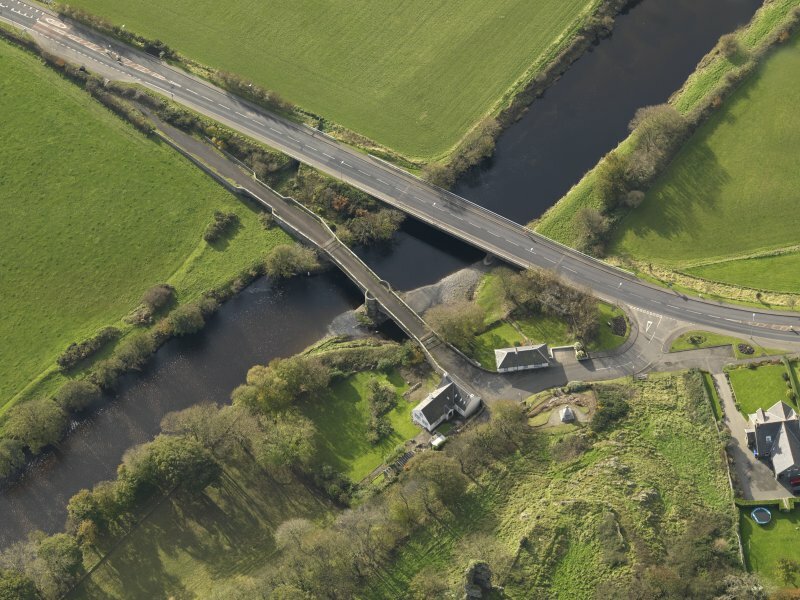 Visible on aerial photographs taken by RCAHMS in 1978 and 1980. Ardstinchar Castle, now ruinous, comprises an early three-storeyed tower, heightened by at least one more storey in the 15th century, when an irregularly-shaped courtyard was added. There are buildings on three sides of the courtyards, an entrance with flanking tower at the N corner, and an external ditch on the E and NE.